Designed for live use, the SP-404A Linear Wave Sampler expands the sounds of the Roland AIRA TR-8 Rhythm Performer for a powerful combination of sample and percussive synthesis. 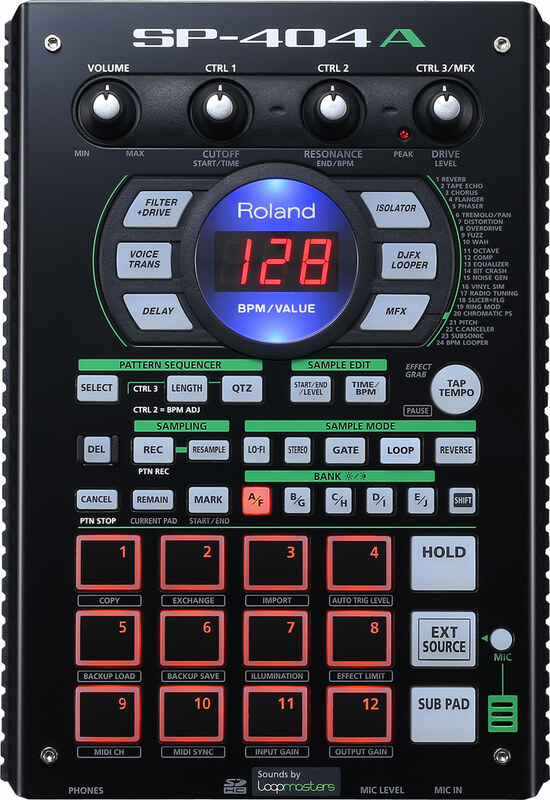 The fast, hands-on approach of the acclaimed SP-series performance samplers is a perfect fit for the impressive rhythmic effects and iconic step-sequencer of the Roland AIRA TR-8. All of the functions and features of the popular SP-404SX are contained in the SP-404A, including its distinctive 16-bit linear sampling, 29 onboard DSP effects, smooth FX switching, and 12 professional performance pads. Plus, a new library of sounds curated by sample-industry leader Loopmasters are provided via the included SD card. 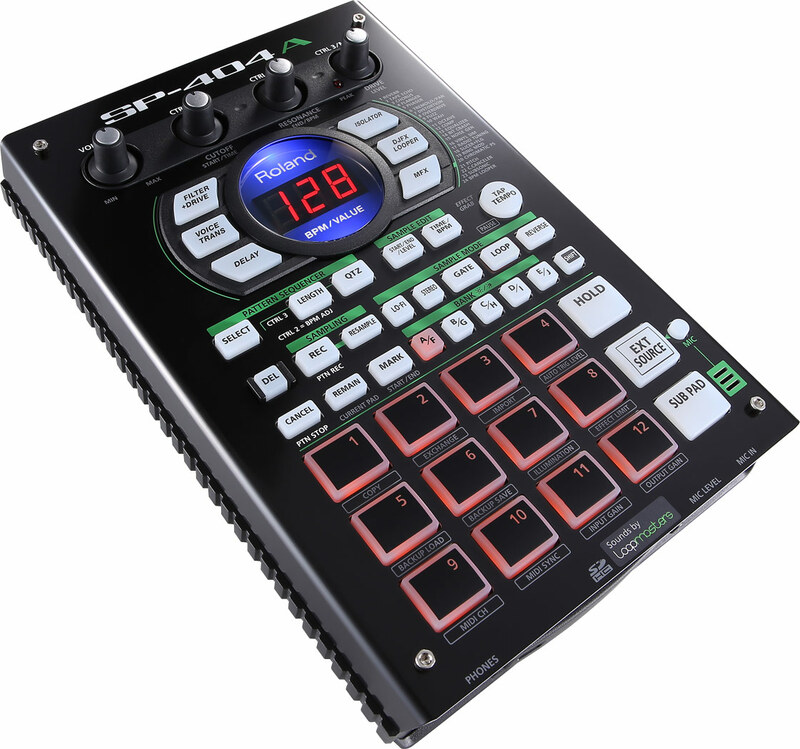 Whether used standalone or controlled by the TR-8, the SP-404A makes for an intuitive and inspiring addition to the AIRA range of performance instruments for DJs, musicians, and producers. 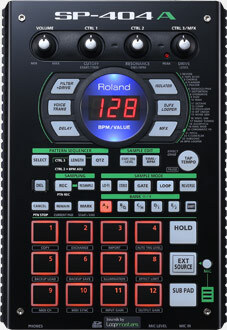 The SP-404A can be triggered from the TR-8 Rhythm Performer for powerful, integrated beat and sample production. Simply connecting a MIDI cable between the two gives you the ability to incorporate samples from the SP-404A and use them in conjunction with your drum patterns. Each of the TR-8’s 11 tracks can trigger a sample on the SP-404A, play a TR-8 sound, or both, enabling you to create interesting layers and accents. The TR-8 can trigger any sample from any of the multiple banks in the SP-404A, making it easy to access new sounds with a turn of the dial. By connecting the stereo output of the SP-404A to the TR-8’s external audio input, you can use the TR-8 as a sub-mixer and processor for the sampler. In this configuration, all samples played on the SP-404A can be effected using the powerful TR-8 Scatter feature to reverse, glitch, gate, truncate, stutter, and perform all manner of rhythmic variations from subtle to extreme, and all in perfect sync. 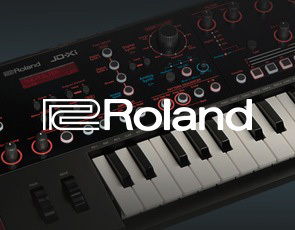 The use of the external input also allows samples to be effected by the TR-8’s per-step Side Chain function—simply program a pattern with Side Chain in TR-REC Mode and access eight rhythmic ducking and gating effects. The SP-404A comes with nine banks of premium samples to get you started with sample looping. The sound library on the included SD card was created by Loopmasters, one of the world’s leading sample developers. 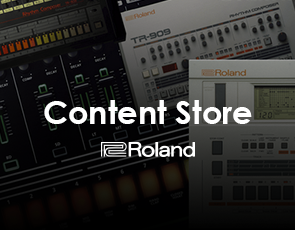 The samples in the library have been designed specifically to complement the TR-8, but will work great in standalone applications. Additional samples can be loaded via the SD Card slot, which supports SDHC card sizes up to 32 GB. Import WAV or AIFF audio files from your Mac or Windows computer using the dedicated software (available in the Downloads section), and then assign them to the SP-404A’s pads. The software is fast and easy to use, as it displays the SP-404A’s pads on screen, and it’s also possible to convert SP-404 format files for use in the SP-404A. Sampling is not limited to the studio with the SP-404A. The built-in microphone allows for simple recording anytime and anywhere inspiration may strike, powered by AC or six AA batteries. Line inputs enable direct sampling from a mixer or external device, and a mic input is also available for sampling with an external microphone. And your sampled material always sounds great, thanks to the SP-404A’s high-quality, uncompressed WAV audio-capture format. 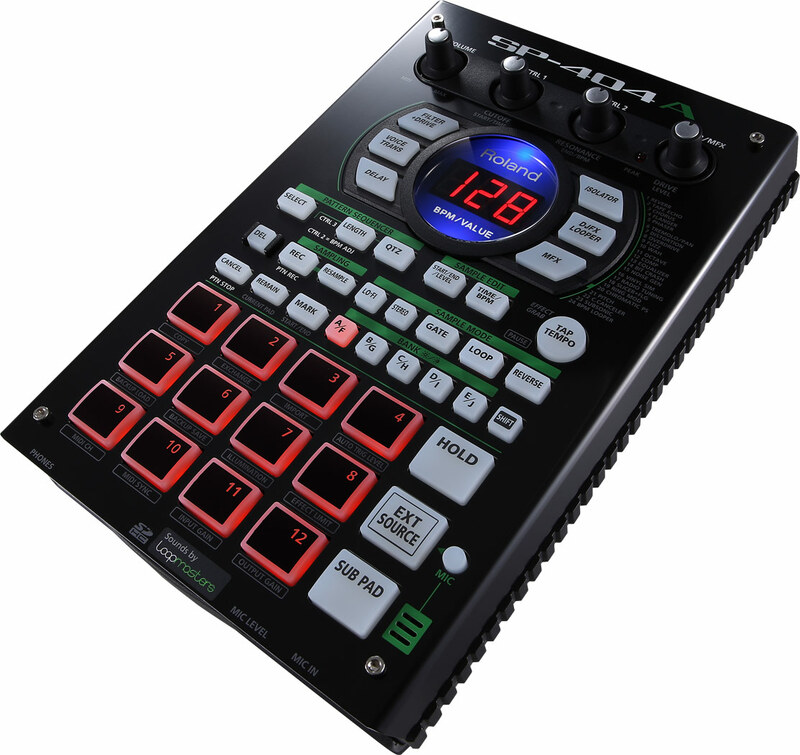 With its interactive loop and pattern sequencer controls, the SP-404A is made to be played. Take command with three non-slip control knobs and 12 rubber trigger pads, plus a Sub Pad for rapid-repeat triggering in real time. On dark stages or DJ booths, the SP-404A is an ideal live machine, as the clearly illuminated pads and bright LED screen ensure clear visibility as soon as you power on. Your signature sounds can be sculpted at any time via the SP-404A’s 29 onboard DSP effects. Essentials include spacious reverbs and choruses plus lush filters and delays, and all provide seamless switching for smooth transitions while performing. There are also striking, performance-based effects on hand, including a voice transformer and a looper. The filter and isolator provide the ability to radically alter your sounds and transform them into all-new elements for reuse. Combined with a DJ mixer, the SP-404A can be used as a standalone effects processor. A unique “limiter” mode is used in 17 effects types to prevent overloading, ensuring stable sound with no unwanted sonic artifacts. This mode is especially effective for live DJ performances, safeguarding your sounds at critical moments. The number of loops that the SP-404A can handle is practically endless, but this feature is only part of its immense power. Songs, jams, and tracks can be built in seconds thanks to the onboard Pattern Sequencer, which is specifically designed for real-time track creation. Optimized for live engagement, it features a powerful Quantize mode which includes shuffle feels for groove, swing, and movement. You can create patterns on the fly via the 99 available measures, and with continuous looping, the ability to layer, structure, and shape a track is available at your fingertips. 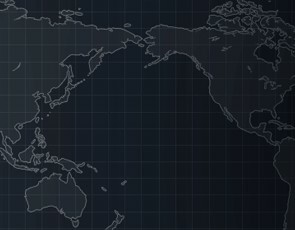 You’re able to store 120 patterns (12 patterns x 10 banks) and recall them instantly. This lets you perform live sets exactly as you envision them, with the comfort of knowing that you always have the freedom to improvise. When you play back patterns, the LEDs surrounding the display flash with the pattern tempo, providing handy visual feedback during your live performances. 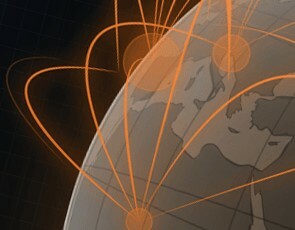 The maximum sampling time (size) for a single sample is approximately 180 minutes in stereo (2 GB). The following shows the approximate total sampling time of the samples that can be stored on one SD card.